Pam and Rich have fond memories of Sunset Beach in Hawaii. 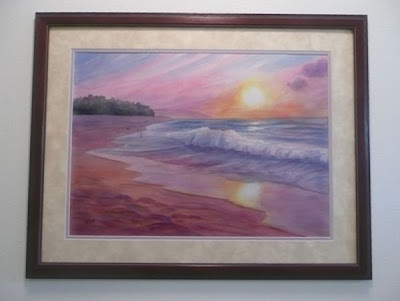 They saw my 5x7 painting of this beautiful scene on eBay and knew they wanted a large watercolor for their foyer. They've done a nice job of framing the painting I did for them. Pam writes, "We love your creation and are displaying it proudly in the entrance to our home. It brings such warmth and inspiration." Thank you Pam, and thanks for sharing your photo with us!